How do we define our social impact? This has been a major concern for us over the last few weeks. Is there a single guiding metric or is it a set of variables? As a social business, this is what we use to calculate how much 'social good' we are actually doing. I had the opportunity to meet with Professor Mohammed Yunus, founder of the Grameen Bank in New York at the NYU: Grameen Lab Change Model in September, and he stressed the need for all social businesses to clearly define and share these metrics. A main question we are constantly asking ourselves is how can we measure this in a consistent manner? For every metric there is an intricate service framework created around it to facilitate its collection. By creating a mock-up of this framework we can easily check for the feasibility of measuring each metric proposed. At the end of the day it is important for us to thoroughly evaluate what we do. This constant metrics collection when coupled with qualitative information from our users is what we are calling our 'Feedback Loop'. This is still in its infancy as a project, and it is truly a cross disciplinary one. More on that soon! I bring all of this up because these past two weeks have been full of evaluation. It has been a very interesting time getting up to speed on the ground realities of our operations. It was very rewarding to see customers at our store the very first time I visited it. Our entrepreneur JT is hard at work and already has a full time sales staff. We had a very productive brainstorming session at our store. Our business manager Santosh brings with him years of experience in the development sector. We have highlighted new marketing initiatives that I promise to document and share as they progress. We have also begun to consider other services and products we can expand to within the purview of our goals. These ideas could not have been developed at such a fast rate in an office in Providence. Having a team on the ground gives a great perspective. The local knowledge the entrepreneur brings is key for us to respond to the needs of our users. We are very big believers in 'Participatory Innovation' our entrepreneur helps in generating ideas that we in turn refine and make scalable. It is the only way to actively respond in this market. We are up to some very innovative and interesting things here in Mumbai. I'm looking forward to sharing my thoughts and developments on the ground on a weekly basis. So watch this space! It’s only been a week since I landed in Delhi, and I am already anxious to get to Mumbai. It’s been over a year since I last visited Dharavi, back then WaterWalla was still a ‘project’. We were just five very ambitious students from Providence with a rough plan and very clear goal: improving the conditions in which slum residents live in. I remember our first meeting with the heads of the women’s groups, and they asked if we planned to actually come back — they were sick of constantly being given false hopes and empty promises. That is when I knew it was real. It’s been over a year since that conversation, and, now, the very women who asked us that question, helped us cut the ribbon to mark our first store opening. Operations on the ground are in full swing. The Indian festival of Diwali is here, and, as in every other part of the country, the residents of Dharavi are making their annual household investments. It’s the Indian equivalent of Christmas sales. WaterWalla is asking the people to invest in better health this festive season. We decided that we needed to show that health is an investment, not just a necessity. Indian parents usually buy things for their children on for Diwali, so, this year, we want the residents of Dharavi to invest in the future of their children. Our Research & Education team in collaboration with the Design team did a great job creating this campaign. It’s exactly this type of thinking that makes WaterWalla exciting. For us, it’s all about using local knowledge to implement new and innovative ways to help people. To solve an issue that plagues the country and has taken many lives thus far, we need to constantly listen to them and be willing to collaborate amongst ourselves and with the community. I’ll be in Mumbai one week from now working fulltime as the Executive Director of WaterWalla India. I have been talking to our Business Manager Santosh and entrepreneur Jitendra (who I have nicknamed JT) on a daily basis. We are all very excited to be working together. Being a theoretical systems and service designer is one thing but getting the chance to put it to practice is the best opportunity I could have ever asked for. There is work to be done, and I am confident that between the teams of WaterWalla India and WaterWalla USA we can make this happen. We are all ready to get out on the field and make what was once a mere thought a reality. The larger population that we hope to impact with this intervention is residents of urban slums, however the groups that we intend to work with, at least initially, are more refined. The first slum we intend to work in is Dharavi in Mumbai, India. This slum is the largest in Asia and with a population of over an estimated 1.2 million we have isolated three primary target audiences with whom intervening will likely impact more general social change. The first group consists of a women’s network in Dharavi with a high level of trust capital and a vested interest in the health and safety of their community. The second group is children of schooling age, around the ages of 8-12. And the third is a small group of entrepreneurs we select from a pool of applicants. Women’s Network: This is a group of highly influential women who actively want to promote healthier lifestyles in their community. They are extremely trusted and have the penetrance required to reach individual households. It will be their responsibility to interface with the matriarchs of Dharavi society, to educate them about the importance of clean water and to motivate them to invest in household sanitation systems and to look for signs of sanitary practices when consuming food and beverage outside the household. Children: Children can be a big force for social change. By getting children excited about the use of these technologies and educating them about their benefits we hope that they will bring that excitement back home and drive their respective families to begin using clean-water tech. Entrepreneurs: These individuals will be the means by which the larger target audiences can acquire the resources needed to use cleaner water in their homes and businesses. The entrepreneurs are charged with running the shops that will serve as the distribution network for the technologies, as well as to run their own profit-incentivized marketing campaigns targeted towards residents and businesses in order to increase sales, and thereby penetrance of the intervention. Our group will be interfacing with our participants in multiple locations, all of these locations however are located within the slums. 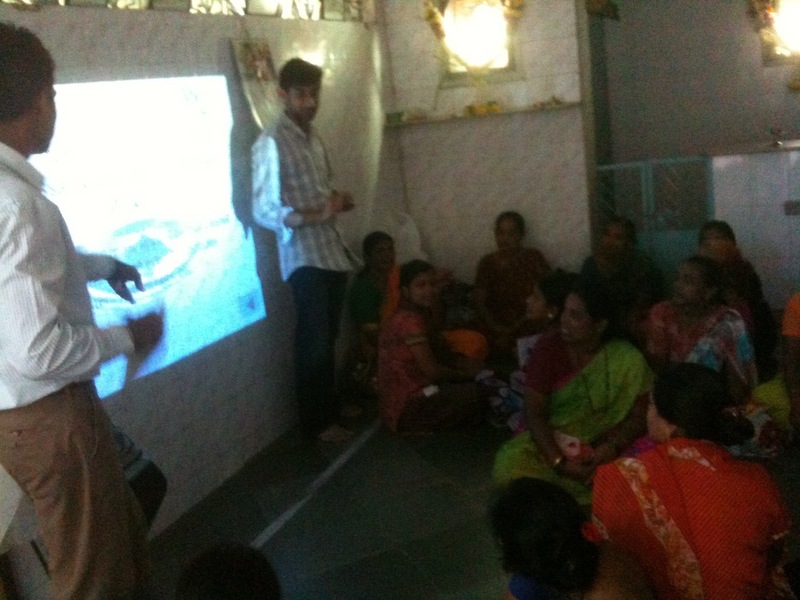 We work with the Women’s networks in community centers within the slums. We intend to interface with the children via the schooling system. And we initially meet the entrepreneurs in our offices for interviews, but work with them most in the context of helping to develop their shops and networks in target areas within the slum that are isolated for having maximal retail presence. Women’s Network: This is our most dispersed performance setting, the women’s network works within the households of slum-dwelling families, in community centers and in any other location that might serve to help them accomplish their mission of reaching out to families. They will operate within individual households, in schools where the may serve as educators, in community centers where they may host functions etc. Children: The performance settings for the children are school and home. School is where the children will develop their excitement for the initiative and in doing so they motivate other children to feel the same way. The primary performance setting however is the home, where these children will convey their excitement and knowledge to their families in an effort to promote behavioral change. Entrepreneurs: The primary performance setting of the entrepreneurs is their local shops where they will actually sell the products and technologies required to impact behavioral change. They will also be interfacing with local businesses and community centers in order to broaden their appear from a marketing perspective. Colin Scaife made promo video for WW, and took us back to i7 (unfortunately we couldn't make it this year). Watch the footage on Forbes! The Waterwalla boys smiling in front of the store they’ve worked so hard to build. We are proud to say a local designer manufactured the logo on our storefront. This is our storefront. We want to make sure the local community believes in us, which is why we chose an image that inspired trust and loyalty. Now one month into our pilot operations in Dharavi this summer, WaterWalla has embarked on a few exciting projects which will hopefully serve as the groundwork for our continued presence in Mumbai. First and foremost, WaterWalla now has a location for its first showroom in Dharavi for the sale and distribution of clean water technologies, supplied by our technology partners. We are in the midst of construction and the entire team is really excited for the grand opening in the coming weeks! Second, WaterWalla began its first training program with 36 female entrepreneurs from a major women's health network in Mumbai. In just a few days of training, these women have already taught our team a great deal and we are just as excited as they are to start work on the ground as our partners in education and sales. We are also proud to add two new local members to our team--Sanjay and Chetan--who will make WaterWalla's permanent presence in India a reality. As always, thanks for all of your support. We look forward to sharing more updates with you soon!